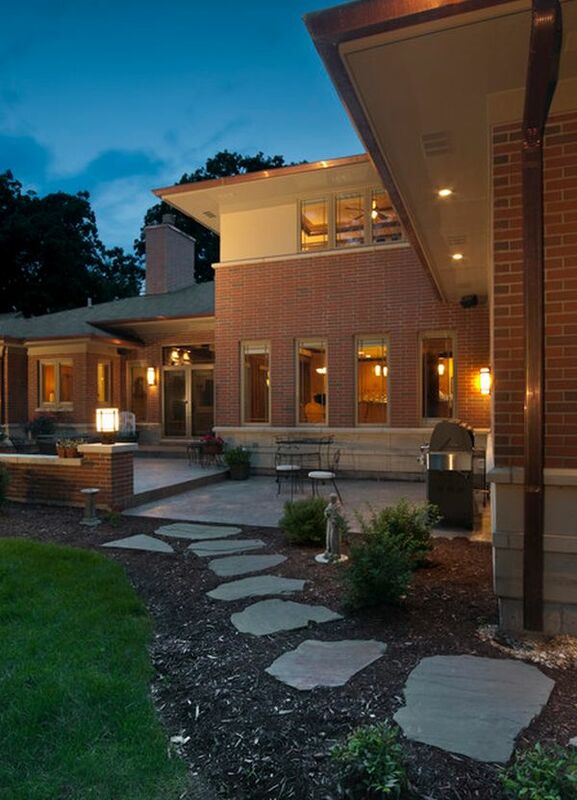 Whether you have a cozy cottage or an imposing residence, the exterior is just as important as the interior. The first impression starts when you first see the pathway leading to the house or to the garden and the rest of the beautiful landscape. 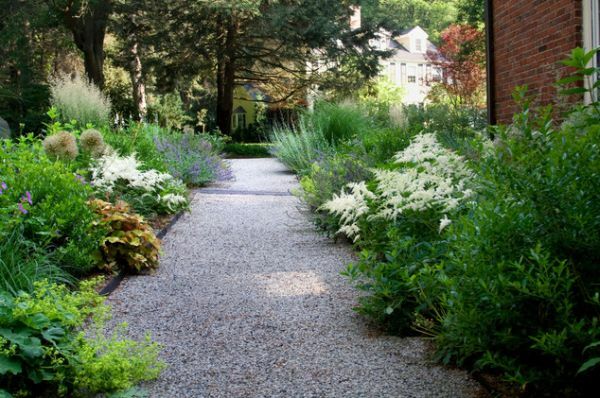 The pathway is a very important part of the outdoor landscape and also the elements that connects everything and brings everything together. So let’s take a look at a few designs and see what makes each one special. 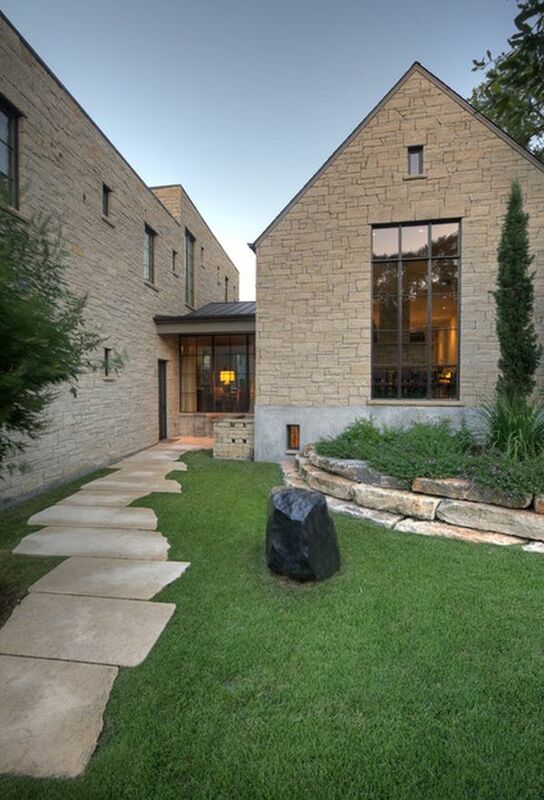 This residence features a beautiful stone pathway where each piece has a unique shape. The fact that there’s no clear shape to be followed and the fact that the stones are so freely shaped and have delicate curves makes the pathway have a casual, almost random design. In this case we have the opposite. It’s a pathway that leads to the barbeque area and, even though it’s also made of stone, it features very clean and clear lines. 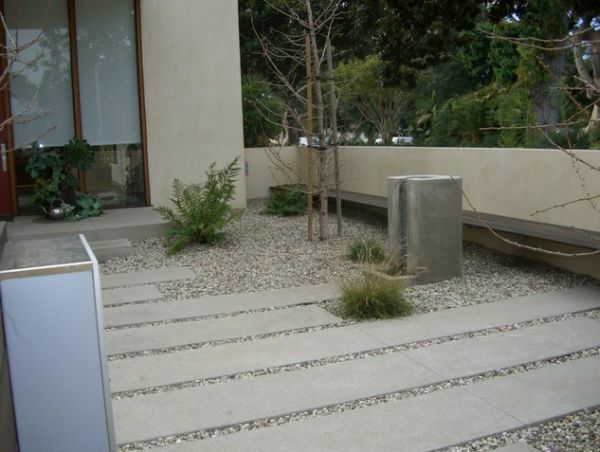 The stone plaques have rectangular shapes and they form a long and straight line with exact angles and lines. 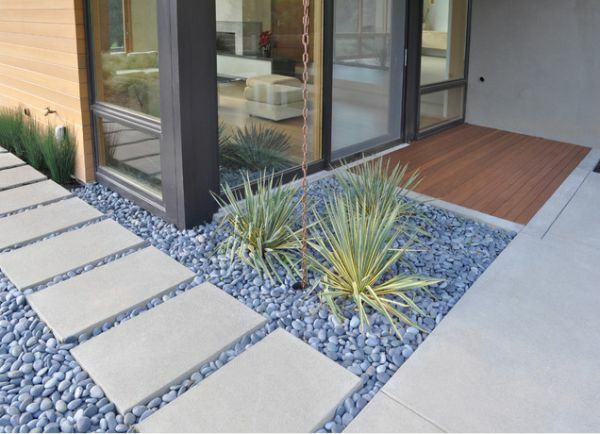 This is a similar pathway but this time the contrast between the slabs and the pebbles is more striking. 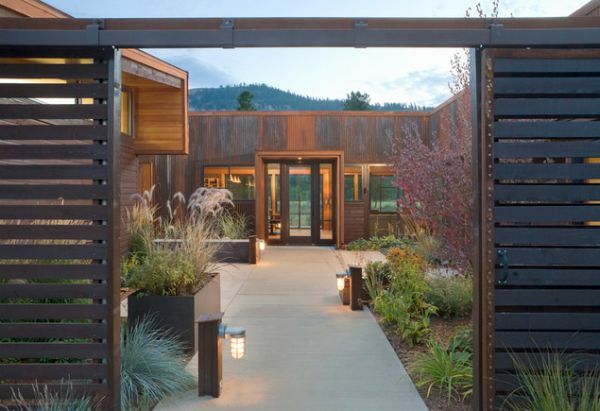 The overall aspect is very clean and simple and the colors used for the pathway match the ones used for the rest of the exterior, including the façade and exterior walls. A similar design has also been used in this case but the difference is that it has a twist. Here the pebbles were replaced by beautiful grass. It’s like a natural rug piercing through the slabs and it has a very beautiful texture. The color contrast is also very beautiful. But if you wish to make the pathway blend in then natural colors should be used and there shouldn’t be any strong contrasts in its design. In this example we have a pathway made of a mosaic of thin slabs placed directly on the ground. Their shapes and sizes differ and seem to be random but they all form a well-defined structure. 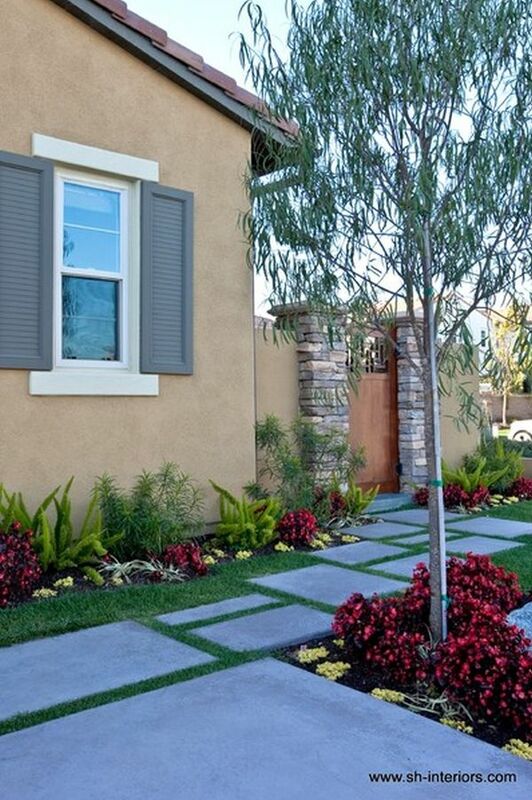 This is another beautiful pathway with stone slabs and grass but what’s interesting in this case is the color palette. 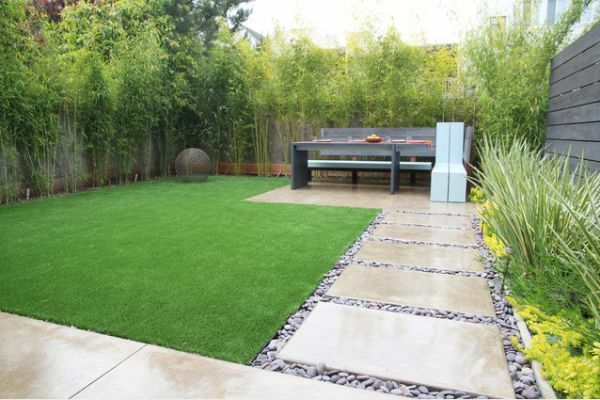 The slabs seem to have a bright grey color with a very subtle hint of blue while the grass is beautifully complementing them with its fresh color. The rest of the landscape has been decorated with red plants in an attempt to make them stand out. 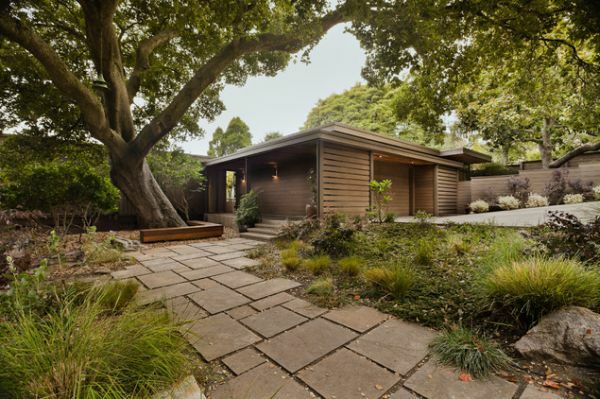 Well-defined lines and angles are beautiful but they’re mostly characteristic to modern designs. For a more traditional and authentic look the best choice would be stone slabs with shapes and lines that aren’t necessarily polished to perfection. 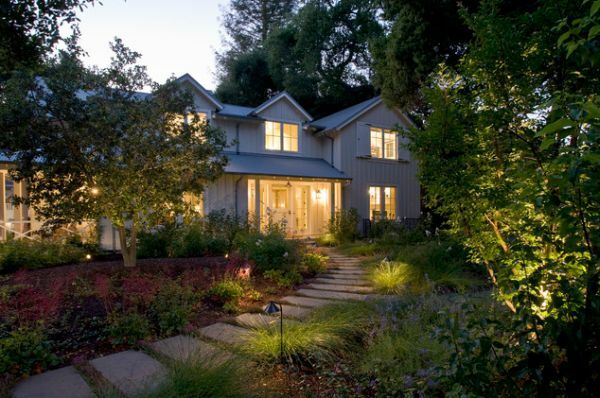 The result will be a beautiful and charming outdoor landscape. So far we’ve only presented pathways that are made of small pieces. But there’s also another option. 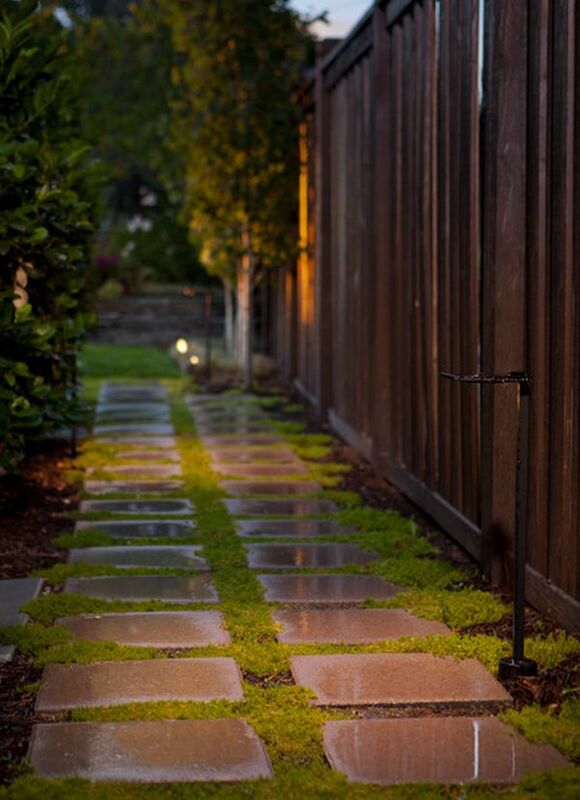 For a more contemporary look you can also opt for a pathway made of one single piece. It would be almost like an extension of the road but the difference will be in the materials sued and the texture. You can also create a similar image and the impression of a cohesive and continuous look by placing the slabs together without leaving any space in between them. The lines will still be visible but the effect will be completely different. The result will be a neat and clean look. Another interesting look can be created by opting for a mosaic. The pathway in this example is made of several stone pieces with random shapes and sizes that have been carefully mixed and placed in an order that allows them to form a continuous line. It takes time to find the right order and design but the results are that much satisfying. If you prefer a very clean, geometrical look, you can either opt for rectangular slabs or square pieces such as in this case. You’ll be able to create a pathway with two rows. Make sure the distance in between the slabs is exactly the same. An alternative is to use larger slabs that only mimic this design. When decorating the outdoor area it’s also nice to play with different textures. It’s the same as for the interior except that in this case you work with other materials. 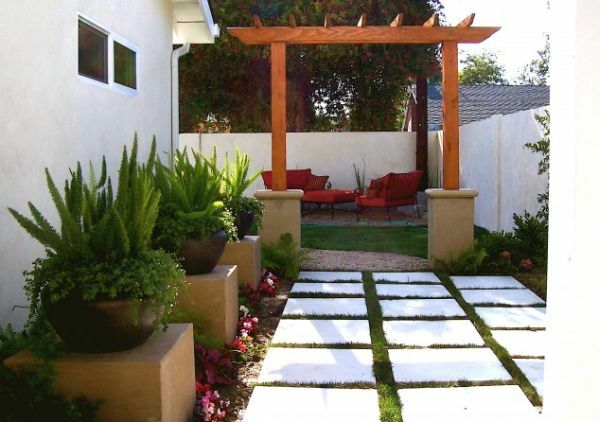 For example, you could opt for a glossy finish for the pathway slabs while the rest of the space features a more rough finish. 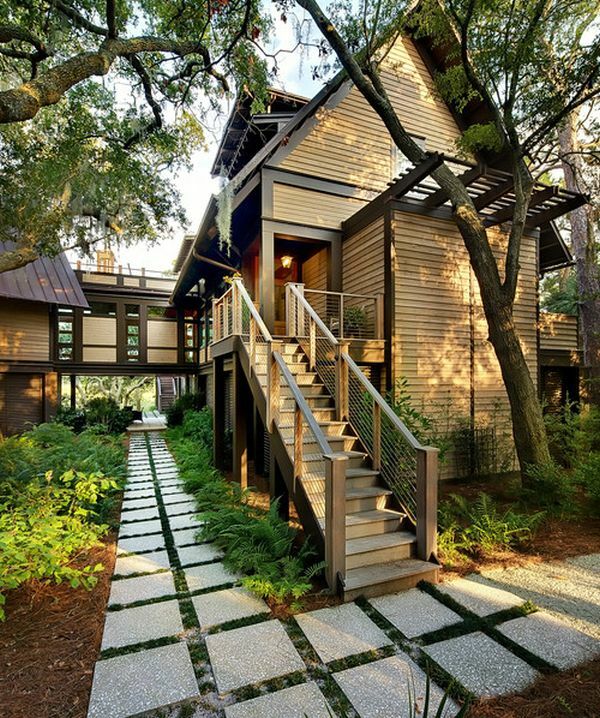 Even though a pathway is usually a narrow portion, you can create your own design and take it one step further. 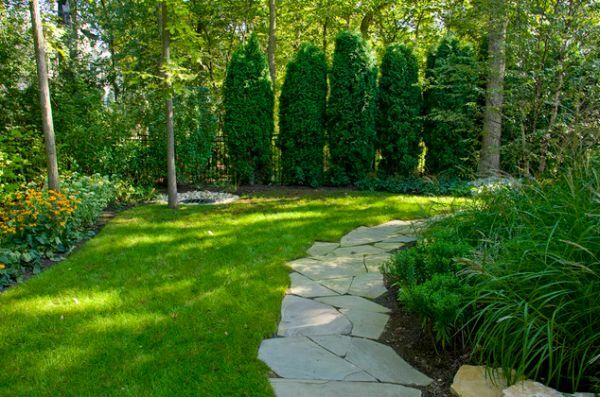 For example, this lovely outdoor area features a pathway made of three rows of slabs. Their crisp white color contrasts with the grass and the effect is strong and bold. 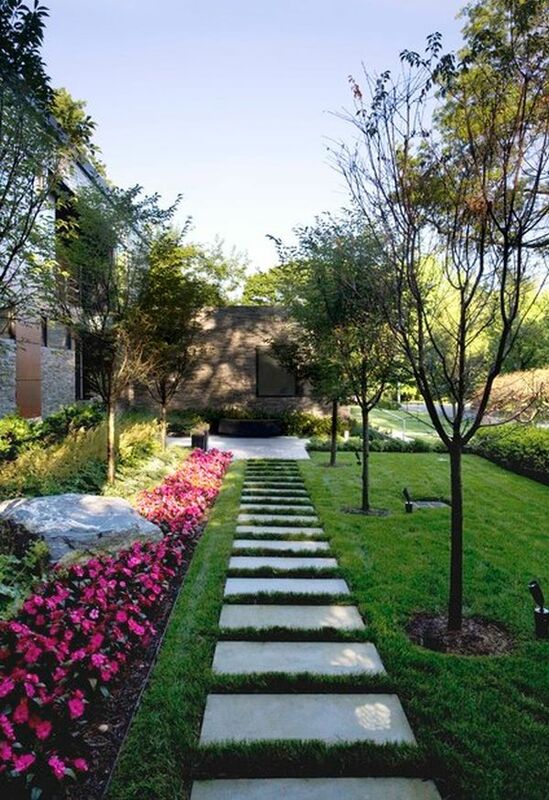 To add an original touch to your pathway you can either opt for a certain material, a certain color or pattern or you can just us plain and simple elements in an unusual way.For example, here we have an asymmetrical pathway where the slabs don’t have the same shape and not even the same dimensions. 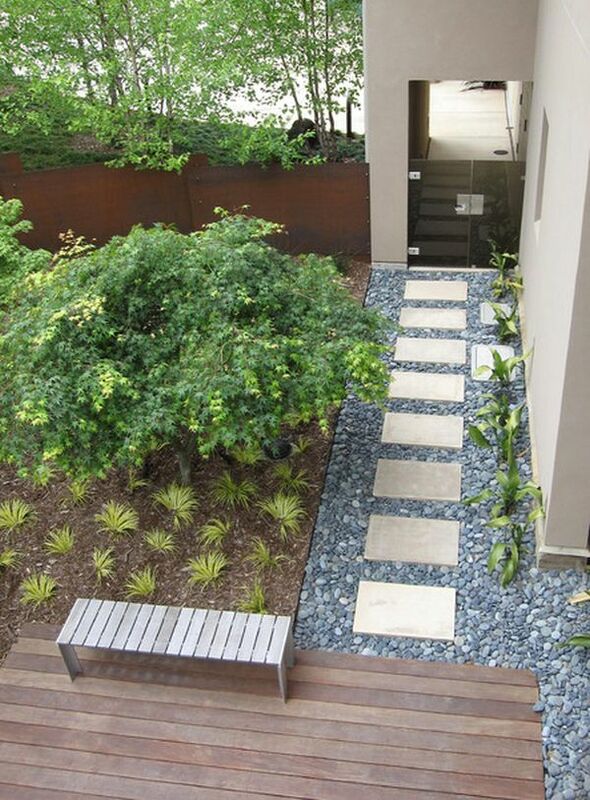 This is a small pathway the leads to the wooden deck and it has a very clean and simple look. It’s basically composed of a few white, square-shaped slabs placed on a bed of pebbles. 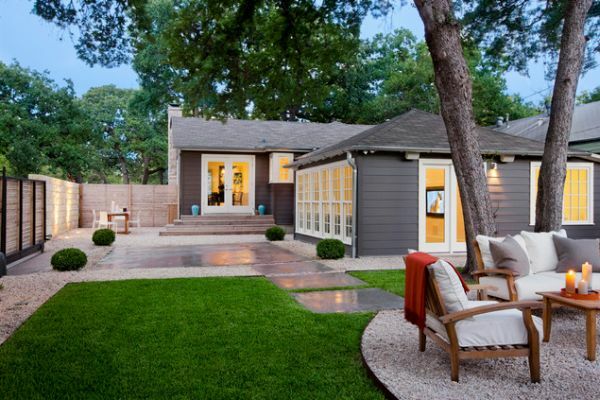 It’s clean, refreshing and chic and it integrates beautifully into the rest of the landscape. Of course, there are ways in which you can personalize your pathway. For a modern and unique design you can replace the traditional rectangular or square-shaped slabs with long and narrow slabs. If you can’t find this design you can put two slabs together. Use different lengths for each piece and alternate them for a random look. Usually there are two options: make the pathway stand out or blend in. But if you’re clever you can do both things at the same time. Take a look at this pathway for example. It looks simple and the color of fence is partially reflected into the stone slabs. However, the pathway still stands out thanks to the contrasts of color and texture. We started with a simple and classical pathway design and we’re going to finish in the same tone. 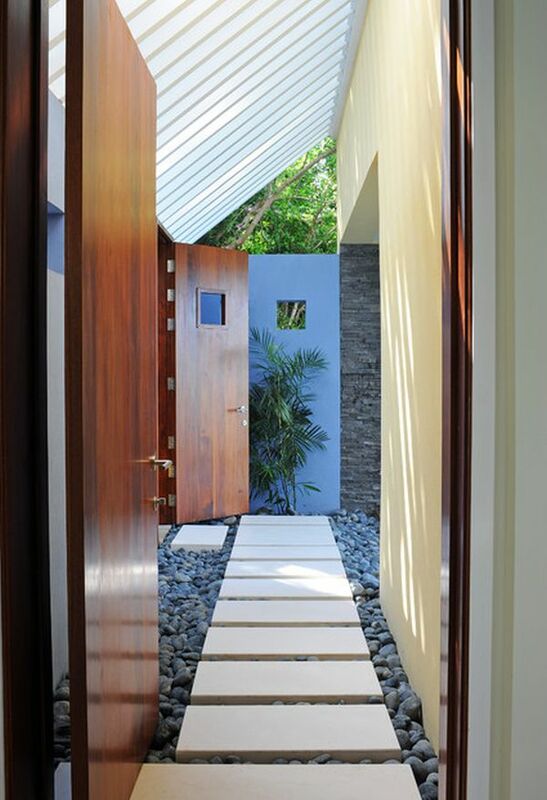 This particular pathway is simple, with clean and clear lines, exact angles and neutral colors. It wasn’t meant to stand out but rather to continue and to match the minimalist décor used throughout the property.